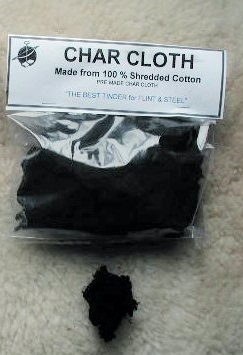 -made” Char Cloth for Flint & Steel Fires. It is made for 100% shredded cotton. While any cotton will work to make char cloth, our shredded cotton provides you with tiny microscopic frayed fibers that actually seem to reach out and grab the sparks from your flint and steel. It is ideal for teaching people how to use a Flint & Steel set for the first time, which is why we use this shredded cotton char cloth in our beginner Survival classes. It also will allow you to impressing people as to how fast you can “catch a spark”, or just to have the most reliable char cloth in your Flint & Steel kit.